A twice-daily skincare routine for men of all ages, skin types, and skin concerns. The Scientific Skincare Program for Men works in harmony with your skin’s natural systems while cleansing, nourishing, and protecting. It is a complete and comprehensive skincare program that is scientifically formulated and specifically designed to deliver the ultimate skin care goal – healthy, clear, smooth, youthful skin for life. The METRIN Scientific Skincare Program is safe and effective for all men. 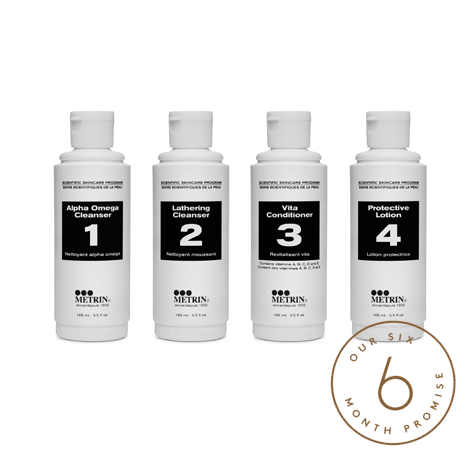 The Pack contains all four steps of the METRIN Scientific Skincare Program for Men (Alpha Omega Cleanser, Lathering Cleanser, Protective Lotion, and Vita Conditioner. It is only available in the full size. How long does it last? 4-6 months. The METRIN Skincare System is designed for twice daily usage. To achieve desired results, you should follow each step twice a day; once in the morning and once at night. At night, skin goes through a natural exfoliation, healing, and regenerative process while we sleep. The METRIN Skincare System works in harmony with this renewal process. In the morning, the METRIN Skincare System cleanses, nourishes, and protects your skin so you are ready for the day ahead! Water, Organic Sunflower Seed Oil, Stearic Acid, Organic Aloe Vera, Methyl Propanediol, Cetyl Alcohol, Triethanolamine, Phenoxyethanol, Tocopherol, Allantoin, EDTA, Methylparaben, Butylparaben, Ethylparaben, Propylparaben, Retinyl Palmitate, Ergocalciferol, 3-0-Ethyl Ascorbic Acid.